Defence lawyers claimed the judge had acted inappropriately in interrupting a cross-examination. 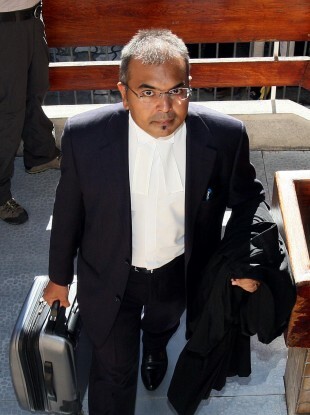 Defence counsel Sanjeev Teeluckdharry claimed the judge had acted inappropriately when he interrupted the questioning of a witness earlier this week. A FRESH LEGAL DISPUTE temporarily halted proceedings in Mauritius day on Day 27 of the trial of the two men accused of killing Tyrone schoolteacher Michaela McAreavey. Defence lawyers disputed the judge’s interventions during witness questioning, and sought to have certain parts of the court record struck out before the judge agreed to allow a new round of questioning to take place. Sanjeev Teeluckdharry, counsel for the prime suspect Avinash Treebhoowon, claimed the interventions had “poisoned the mind” of the jury during his interruptions on Wednesday and Thursday. “The court has intervened in the cross-examination of my client giving the impression that the judge came down into the arena between the two parties,” he said in his motion, listing 30 questions and interventions from judge Prithviraj Fekna. Prosecution lawyers originally opposed the motion – calling it a “direct attack on the judge’s impartiality” – but later agreed to the re-questioning, though asking the judge to give a full explanation of the dispute to the jury whenever the case was being summarised. Court proceedings were adjourned to discuss the motion, resuming four hours later to hear judge Fekna reassure both parties that he had been guided so far by impartiality and gave examples of how his previous interventions followed that principle. The jury was informed of the matter before the case – which is now entering its seventh week – was adjourned for the weekend. Treebhoowon and another hotel worker, Sandeep Moonea, both plead not guilty to the charge of murdering McAreavey in January 2011, while she was honeymooning with her husband John. Email “Michaela murder trial: Defence team’s legal dispute causes fresh delay”. Feedback on “Michaela murder trial: Defence team’s legal dispute causes fresh delay”.